THE HIGH COURT has increased a damages award to a woman who banged her knee against the leg of a table while sitting down to dinner. Justice Mary Faherty heard that hairdresser Annette O’Connor had been directed to a table in The Mullingar Park Hotel restaurant, had waited while the manager politely withdrew her chair, then sat down and injured her left knee as she pulled her chair in to the table. O’Connor, (48) of The View, Larchill, Santry, Dublin, had booked Mother’s Day weekend at the hotel with five friends in March 2011. 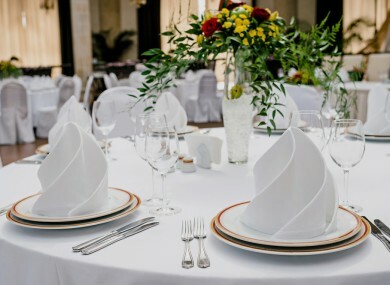 She claimed that being directed to the table setting right over the leg, which was concealed by a tablecloth, constituted “a trap” and negligence on the part of the hotel owners Euro Plaza Hotel Limited which trades as The Mullingar Park Hotel. She had been awarded €18,000 damages at Mullingar Circuit Court by Judge Doirbhile Flanagan whose judgment was appealed to the High Court. Justice Faherty affirmed the lower court’s finding and increased damages to €20,000 and costs. O’Connor’s legal team claimed negligence against the hotel on the basis the table set-up constituted a trap or hazard for patrons and that their client had been directed to sit in an unsafe spot. O’Connor claimed she immediately felt pain and shock but had her meal before retiring to her room where staff had brought her an ice pack and a drink to settle her nerves. When she returned home she had attended her local doctor, the Beaumont Hospital for X-rays and later a specialist in muscle spasm. The injury had disrupted her personal and professional life as a hairdresser. Contributory negligence could not be applied to the O’Connor as she had been specifically directed to the table and could not reasonably have been expected to have embarked upon an investigation as to where the legs were. Email “Woman who banged her knee sitting down at restaurant table awarded damages of €20,000”. Feedback on “Woman who banged her knee sitting down at restaurant table awarded damages of €20,000”.